For father's day, Christmas, birthdays, and more, the commander 10 watch box provides a uniquely handsome choice. This wide, rectangular box is lined with beautiful white suede and features 10 pillows, allowing you to store watches and bracelets in a way that keeps the bands ready to wear. The box itself is crafted from sturdy cherry hardwood solids, featuring a clear glass inset top that displays your pieces without exposing them to dust. 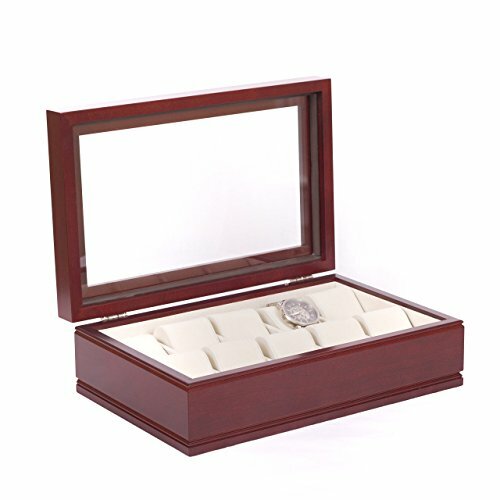 The watch box is available in your choice of either mahogany or cherry finishes (subject to availability). About American Chest don't settle for inferior-quality imports, let American Chest provide you with beautiful, hand-crafted chests, boxes, urns, and more. For three generations, American Chest has created the finest products available, made from genuine American hardwood and never mdf or plywood. Each of their pieces is individually inspection for imperfections, ensuring a snug, tight-fitting lid and smooth, hitch-free drawers. The products are all sanded and finished by hand for guaranteed perfection. With over 100 years of experience, you can rest assured that any piece purchased from American Chest is the finest available on the market. Overall dimensions: 13l x 9d x 4.5h in.. Constructed from thick hardwood solids. Your choice of available finishes. Lined with soft white suede. Store up to 10 watches at once. Clear glass inset top.